2. How do I know if I have sensitive skin? 3. 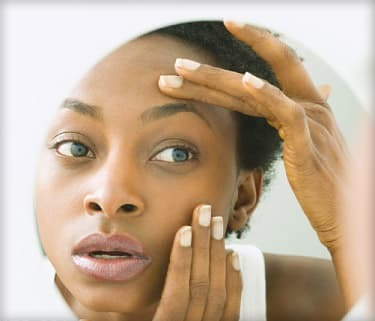 What causes sensitive skin reactions? 4. Are there medical tests for sensitive skin? 5. Should men be concerned about sensitive skin? 6. What are some tips for caring for my sensitive skin, especially on my face? 7. What should I look for in skin care products that will make them less irritating to sensitive skin? 8. What types of cosmetics are less irritating to sensitive skin? 9. With an unfamiliar skin care product, how should I test for a sensitive skin reaction? 10. What are some tips for protecting my sensitive skin in winter and summer? 11. What should I look for in a sunscreen to protect my sensitive skin? 12. When and how do doctors diagnose and treat sensitive skin? 13. Which clothing fabrics are less irritating to sensitive skin? 14. What diseases and conditions may be associated with sensitive skin? 15. Does the FDA regulate the safety of cosmetics? 16. Are skin care products labeled “hypoallergenic” safer for sensitive skin? 17. How can I tell if a particular skin care or household product is likely to irritate my sensitive skin? 18. Can healthful eating help sensitive skin? 19. Can a child with a disease or condition related to sensitive skin outgrow it? 20. Can sensitive skin be inherited? Many people say they have sensitive skin because skin care products, or household products that contact their skin, cause stinging, burning, redness, or tightness. Or they say they have it because even though they have no visible effects after contact with a product, it always makes their skin feel uncomfortable. Genetic factors, age, gender, and race differences in skin sensitivity are less well-defined but still may play a role in causing skin reactions. Patch testing may identify signs of allergies that are causing or contributing to sensitive skin. Otherwise, it's difficult for doctors to test for sensitive skin because so many factors can cause it. Cleansing. From one person to the next, sensitive skin responds differently to different cleansing methods. But most dermatologists agree that “deodorant” soap or highly fragranced soap contains strong detergents and shouldn't be used on the face. Soap-free cleansers such as mild cleansing bars and sensitive-skin bars along with most liquid facial cleansers have less potential for facial skin irritation than soaps. The same is true for cleansing creams and disposable facial washcloths. Use face powder, which has few preservatives and minimal risk of skin irritation. Use a silicone-based foundation for minimal skin irritation. Do not use waterproof cosmetics; you need a special cleanser to remove them. Use black eyeliner and mascara; they appear to be least allergenic. Use pencil eyeliner and eyebrow fillers; liquid eyeliners may contain latex and may cause an allergic reaction. Throw out old cosmetics; they can spoil or become contaminated. For several days, apply a small amount behind an ear and leave it on overnight. If your skin does not become irritated, follow the same procedure, this time applying the product on an area alongside an eye. If you still don't see irritation, the product should be safe for you to apply on any area of your face. First, wear a sunscreen year-round. Use one that says broad spectrum with a sun protection factor (SPF) of at least 30, and use it every day that you will be in the sun for longer than 20 minutes. Remember, the sun’s skin-damaging UVB rays are strongest between 10 a.m. and 4 p.m. Avoid going out in the sun during these hours whenever possible, any time of the year. Take warm, not hot, baths and showers -- and fewer of them -- and use a soap-free cleanser. Minimize skin dryness after bathing: Pat your skin dry and apply moisturizer while your skin is still moist. In summer, keep in mind that tanning damages your skin. Don’t lie out in the sun, even if you’ve applied sunscreen. See guidelines for choosing a sunscreen below. If you do go out, wear a wide-brimmed hat and sunglasses and tight-woven clothing that covers your arms and legs. Apply your sunscreen 15 to 30 minutes before going out, and reapply it every 80 minutes, after swimming, or if you’ve been perspiring heavily. Your sunscreen should be rated SPF 30 or higher. Its active ingredients should be only zinc oxide or titanium dioxide. This is because you cannot have an allergic reaction to these physical sunscreens. They deflect the sun’s UV rays instead of absorbing them as chemical sunscreens do. Most people with sensitive skin don’t seek medical help for mild irritation from skin care products. Instead, they try different products until they find one that doesn’t irritate their skin. They typically only see a dermatologist if their skin condition worsens. When consulted, the dermatologist will first check for skin conditions such as eczema, rosacea, or contact with a skin irritant. They may give you skin patch tests to check for allergies. The dermatologist will also ask about your skin care plan, identify any potential irritants, and recommend milder skin care and household products that are less likely to irritate sensitive skin. Smooth, soft, natural fabrics, such as fine cotton and silk, feel best worn next to the skin. Cotton is cool where silk is warm; both are absorbent, helping to draw body moisture away from the skin. Rayon and linen are also comfortable for sensitive skin but are heavier than cotton or silk. Clothing should be loose fitting with a minimum of creases and folds. If you have skin disorders such as acne, psoriasis, contact dermatitis, rosacea, or eczema, you’re likely to have sensitive skin. The FDA regulates the manufacture and marketing of cosmetics -- but not in the same way it regulates prescription medications and medical devices. Hypoallergenic skin care products are not necessarily safer for sensitive skin. There are no federal standards governing manufacturers’ use of the term “hypoallergenic.” So it can mean whatever a particular company wants it to mean. The National Institutes of Health (NIH) and the National Library of Medicine (NLM) Specialized Information Services group maintain a Household Products Database online. You can look up products by brand name to see what’s in them and whether anything they contain could irritate your skin. Eating healthfully is good for your whole body, including your skin. A child with sensitive skin due to eczema has a very good chance of outgrowing it before age 5 and a 40% to 50% chance of outgrowing it by the time he or she is a teen. About 80% of people ages 11 to 30 have outbreaks of acne. For most of them, acne typically goes away sometime in their 30s. Psoriasis is considered a chronic, lifelong disease. Yes. A number of the skin diseases and conditions linked to sensitive skin are known or believed to run in families. They include acne, eczema, psoriasis, and rosacea. Skin irritation from a reaction to a skin care, cosmetic, or household product is not inherited. American Academy of Dermatology: "Sensitive skin;" "Stress and skin;" and "Men's skin care." FamilyDoctor.org: "Skin Rashes and Other Changes."